This entry was posted on February 13, 2012, in GQ. Bookmark the permalink. “The English breakfast is amazing,” says producer and DJ Xaphoon Jones as he polishes off the greasy remains of a fry-up in a glass-walled penthouse boardroom inside EMI’s London headquarters. Jones’ band-mate, rapper “Chiddy” Anamege pushes his similary clean plate away and agrees: “When you got that hangover, or when you don’t get any sleep at night, it’ll cure it!” GQ.com are here to discuss both breakfast and Breakfast, Chiddy Bang’s debut record that finally gets a release next month. It arrives two years after the duo’s single “Opposite Of Adults” which samples MGMT’s “Kids”, exploded onto the internet on its way to racking up 16 million views on YouTube. They’ve spent that time touring the world, including a series of UK shows with Tinie Tempah, and arrive in London with an arsenal of war stories about getting stoned with Keith Richards, why venues keep thinking they’re trying to score cocaine and why they could be the rap world’s new Fresh Princes. GQ.com: We understand that it was in West Philadelphia you were born and raised. Where would you say you spent most of your days? Xaphoon: I was born in West Philadelphia, but I was raised in North-West Philadelphia. Actually I did go to the same middle school as Will Smith years later – J.R. Masterman on 17th and Spring Gardens. I guess from ages 10 to 14 I kind of got the same schooling as Will Smith. There definitely were “a couple of guys up to no good in my neighbourhood”. Chiddy Anamege: That show was very important to me growing up! I’ve seen every episode. Will Smith’s one of my favourite ever people. XJ: You are legend, Will Smith. CA: We’ve got this song called “Out 2 Space”. It goes: “This the feeling that they can’t control / We’re taking off to the stars now / I’m getting stoned while my brother rolls / so me and Keith will prob’ly blow it down.” The significance of that is that we got to smoke weed with Keith Richards in the studio. XJ: Also because he looks like a British ninja zombie pirate. He carries around these briefcases full of the Jack Daniels bottles you get on airplanes. But that’s why we love that line about “getting stoned while my brother rolls”. Unless you know the story you won’t realise it’s a Rolling Stones reference. And Gentlemen’s Quarterly are the first people to know the meaning! What is the perfect Chiddy Bang breakfast? XJ: My ideal breakfast is probably something simple at home with my dad. Toast and eggs. Coffee. CA: I’ll go with Eggs Benedict, baby! XJ: I put him on to that. That Hollandaise sauce is tricky to make, though. You’ve got to do it over the flame and if you do it too short, it’s not thick enough. If you do it too long the eggs in the sauce scramble and you get chunky sauce. Why did you decide not to put “Opposite Of Adults” on the album? XJ: I think our label was a bit shocked. They kept saying: “What you talking about? We signed you for that! You don’t want to put a hit on the record?” To us, it’s a dope song but it’s almost too easy to make a hit song if you’re starting with a hit song. It’s like, how do you make a million dollars? Start with two million dollars. We wanted to create the album from start to finish, not just get signed for big songs and then fill it in. We wanted to take the time and do it right. CA: We’ve taken more creative control. Instead of just sampling stuff that’s well known we’ve sampled a few more obscure things and created more ourselves. Which contemporary artists do you admire? XJ: We would not be around if it weren’t for Kanye West. He loosened the bonds of what defines rap as rap. In the late Nineties and early 2000s rap had a very gangster image. It had a specific sound, and if you weren’t getting shot up a hundred times like 50 Cent, then you weren’t going to get a record deal. People like Kanye West came in and went: “You know what? I’m a nerd! I’m going to do fashion. I’m going to sample Daft Punk. I’m going to do whatever I want!” He furthered how self-expression could be done through hip-hop. Chiddy, you broke the world record for the longest freestyle rap with a time of 9 hours, 18 minutes and 22 seconds. How did you achieve it? CA: It was our manager’s idea. He told me I was allowed three second breaks and I felt like that was enough time for me to come up with the rhymes. I basically just had a good nap [beforehand] and MTV got me a good breakfast. Then Xaphoon started playing instrumentals that I love and that I’d grown up on so I’d constantly have fresh inspiration. XJ: No world record for me! Just a cheeky nine hours of DJing, no big deal. CA: For my freestyle, they had a judge there the whole time. I was close to messing up when I went into the bathroom. My manager was like, “Yo! You gotta keep rappin’ or you’re gonna lose it!” I guess I was taking slightly longer-than-allowed pauses and the judge was trippin’. But at the end of it we prevailed. It was a fun experience, but I’ll tell you what, at the end of it I just stopped talking. Who’s the best-dressed British man? XJ: G FrSH! No question! He’s signed to Tinie Tempah’s label. He’s just the freshest dude in the game! He wears, like, racoon tail hats and comes in with his custom clothing line and his fresh Nikes on. You need to do just a separate GQ issue on the ways of G Frsh. CA: My style is mix-and-match. I’ll wear a cheap little Walmart v-neck and jeans but then put it with a Fendi belt and Ferragamo sneakers. XJ: He does the “swag rapper” thing, I do the “homeless hipster” thing. We have the balance. 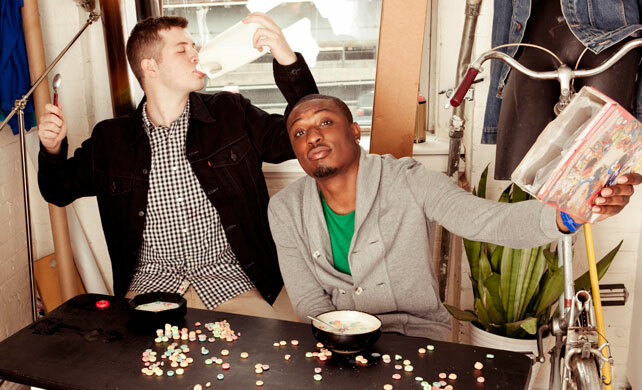 What’s the biggest misconception about Chiddy Bang? XJ: I think people who give us a quick look-over will do what the label says and listen to the singles – but I don’t think looking just at “Mind Your Manners” or “Ray Charles” is going to give you a portrait of what we do. Those are our poppiest moments, but they aren’t our favourite moments. CA: It’s the classic music industry story that the s*** we like the most is not the s*** that the label likes the most. Our favourite tracks are not the singles. XJ: At the end of the day, if the label don’t feel like there’s a chance to profit immensely off you then they won’t put the record out. Especially in hip-hop, it’s rare to get a release date on a major label. You have maybe 15 major label hip-hop release dates in one year and just to be part of that is a blessing. So if people want us to dig deep and find the poppiest side of ourselves so that they have something to spin on the radio, that’s cool. For me what I’m proud of is the little moments in-between, pieces that are woven into the fabric of the album. So to anyone who thinks of us as a radio chart act I would say: just drive around London, put on the album and maybe skip over the singles! Maybe I should make my own bootleg version of the album! CA: The Steve Jobs biography by Walter Isaacson. A lot of people don’t know how much the man did. His approach to design, coming up with new ideas and getting the best out of people was unlike anybody I’ve ever read about before. XJ: I’m reading The Man Who Recorded the World, a biography of Alan Lomax, who’s the folklorist in the United States who was the first person to record people like Leadbelly and various other blues artists. He travelled around the South in the Forties with a wax cylinder machine to record these artists who no-one had ever recorded before. It’s amazing to read as a producer and engineer, but also as someone who travels a lot and is exposed to a lot of different music. It’s by John Szwed, who also did a biography of Miles Davis. What music do you love that would surprise people? XJ: Well in America, nobody really knows what grime is and I’m a very big grime fan. I’m not necessarily trying to work that in to what we do, but sometimes in DJ sets I’ll pull out some Wiley and the earlier grime stuff, or even more recent stuff like P-Money and Trim. I love to drive around Philly and blast that because people there don’t understand it all. CA: My parents are from Nigeria, so I listen to a lot of Nigerian music. That’s the soundtrack to my house. You know D’banj? He’s a big star in Nigeria and he just got signed by Kanye. Tunes like the “Ashawo Remix” by Flavour are just crazy. XJ: [Whips out laptop, opens Flavour – Nwa Baby (Ashawo Remix) on YouTube. They both start dancing.] This is what we’re talking about. He’s on the roof! This is such a big tune!